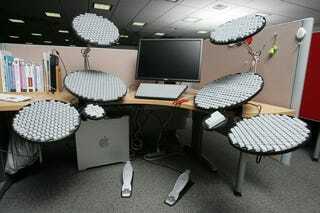 As part of what is apparently an April Fool's Day Prank over at Google Japan, they've made a pretty impressive drumset keyboard, complete with emoticon keys. The funny thing is, with all those kana characters they use over there, a keyboard with this many keys isn't that ridiculous. I mean, they have uses for all of them. It's just not entirely practical.